Pay attention to the croc player’s cards, when you see the hungry croc… JUMP! Keep playing until all other frog players have had all their tokens ‘munched’. The winner is the last player with any tokens left! 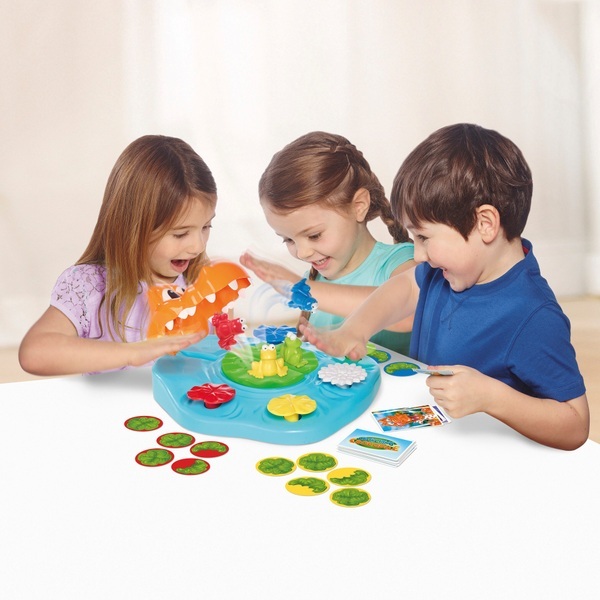 Crunchin’ Croc is the crunching, munching crazy crocodile game from TOMY! To play the game each player takes it in turn to control the croc – the other players each choose one of the frogs sitting on a lily pad. It takes the slickest, smartest frog to win this game and avoid becoming croc’s lunch. As the croc player turns over the playing cards one by one, keep an eye out for the hungry croc card! If you see it, jump quickly to avoid his snappy jaws. Keep playing until all the other frog players have had all their tokens ‘munched’. Can you be the last frog standing?